Fying into Denver, seeing those huge mountains in the distance, it’s still so weird that we were there. I never would have guessed a few years ago that we would have made it out that far west, that far from home. Hubby hates flying, so his willingness to go out there for one of our longest known friends was the only reason we made it! And we just barely did. 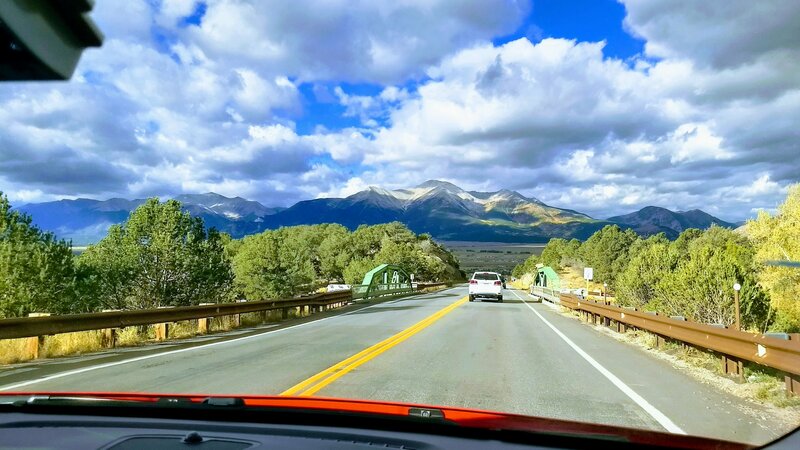 After a near miss in midair freak out, we grabbed our rental car and started out on our five hour drive through the Rockies. In the middle of the night. Denver seemed to stretch for miles in the valley beneath the mountain, and I felt a large familiarity as we sat in bumper to bumper traffic, but as the miles slowly slipped away, the mountains suddenly popped up and we’re right next to us as if we had only blinked. I swear the sun was more intense at that altitude as it descended below the looming mountains, and the night sky began to sprout sparkling light. I had no idea how much manufacturing was based out of Denver, but the Purina plant sticks out in mind the largest with it’s signature pet food smell. The skyline of Downtown sprawled across the horizon as the city passed us by just as the interstate gave way to the mountain pass. Two things I realized about Colorado during this drive which may be exclusive to the mountain roads. One, whoever built the roads does not believe in guardrails, probably because if you’re going to fall, your gone regardless of speed. And two, streetlights are reserved for cities. Sleeping was another oddity at that elevation. Every time I tried to slip into a deep sleep, my breathing would cause we to wake again. My mind wouldn’t shut off, and my dreams sent me on wild rides through the dark mountains. I woke up many times through the night trying to catch my breath as my heart raced from my latest dream. When we woke up in the morning, I dreaded getting back in the car and continuing the drive on those roads, but I wanted so badly to see my friend. With coffee in hand, hubby and I pushed on to South Fork, and our final destination for the weekend. We passed red rock mountain after mountain, but the last half of the drive was nowhere near as teeth clenching as the first. With the sun shining brightly, the land lit up in it’s vast array of colors of the changing leaves, rocks, and valley floors. It was beautiful! All apprehension melted away as the last two and a half hours melted away in gorgeous sights and breathtaking scenery! When we finally arrived in the sleep it off South Fork, we checked into the hotel and before even making it to our room, we were out of breath! At 8,000 feet, breathing at what we knew was a normal rate was going to be hard!